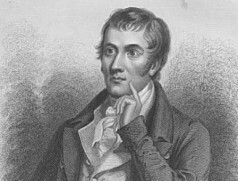 Robert Tannahill – the ‘Weaver Poet’ – was born on 3 June 1774 on Castle Street, Paisley, the son of James Tannahill and Janet Pollock. He died on 17 May 1810, drowned in a culverted part of the Candren Burn under the Paisley Canal. He has long been overshadowed by his contemporary Robert Burns (a brother poet whom Tannahill looked up to). 2010 marks the 200th anniversry of his tragic death. To mark that anniversary, several groups in Paisley celebrated the life, work, and language of the man, and here, at the SLC, we remembered him as well. Tannahill’s father was a weaver who had feued a piece of ground at Queen Street, Paisley and bulit a house on it in 1775. This house, or rather cottage, is where Robert grew up and lived most of his life. In 2003 it was greatly damaged by a fire, but is now restored and sometimes open to the public. It is the meeting place of the Paisley Burns Club who upkeep the property as an important monument connected with Tannahill and the Scots language. Young Robert was apprenticed as a weaver at the age of 12 in 1786 and spent a brief time working at Bolton, in Lancashire, England. He returned home to Paisley and began to compose pieces of verse in Scots which were published by various journals. Scottish weavers had a reputation for literacy and cultivated tastes because their work, often done at a loom with the feet, allowed them the freedom to hold and read books. When his father died in 1802, Robert joined the newly established ‘The Paisley Literary and Convivial Association’ which was an oulet for his literary tastes. He was also a founder member – and secretary – of the Paisley Burns Club in 1805. This is believed to be the oldest formally constituted Burns Club in the world. His major breakthrough came in 1807 when a volume of his poems and songs was published under the title ‘The Sodger’s Return’. He is also remembered for his song ‘Braes of Balquhidder’ which is the basis of the ballad ‘Wild Mountain Thyme’ (which has the line ‘will ye go lassie go’), as popular today in Scotland as ever. The band ‘The Tannahill Weavers’ are named after him. However, Robert was prone to depression – the mark of many a creative mind – and could not take the rejection of some of his work by Edinburgh publisher Archibald Constable in 1810. Robert drowned himself in the Candren Burn and his body was later discovered by his two brothers. He was buried at Castlehead Cemetery, Canal Street, Paisley, in an unmarked grave in what was formely the West Relief Church. In 1866 a granite monument was erected here to his memory. There is also a statue to Tannahill in the grounds of Paisley Abbey, erected by public subscription in 1883. On the left hand menu you will see a number of articles relating to the life, music and poetry of this respected Scots language writer and Paisley buddie.